Fire Pokémon turning into ice Pokémon. New colors for old favorites. Introducing “Alola Forms,” which will debut in Pokémon Sun and Moon. The trailer also talks about taking on a rite of passage called “The Island Challenge,” and it really looks like something that might replace the old gym system. Instead of gym leaders, you’ve got “trial captains,” which will issue different sorts of challenges to the player. If successful, the player can encounter something called “totem Pokémon” at the end of each trial, and these appear to be special, souped-up versions of already existing Pokémon. Additionally, these new monsters can call for help and in the middle of battle, causing more Pokémon to appear. 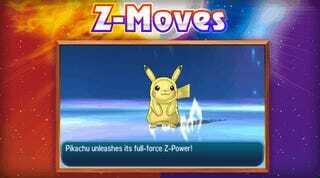 Every type in the compendium will have its own special Z-Move, all of which are triggered by trainer dance moves. Awesome.